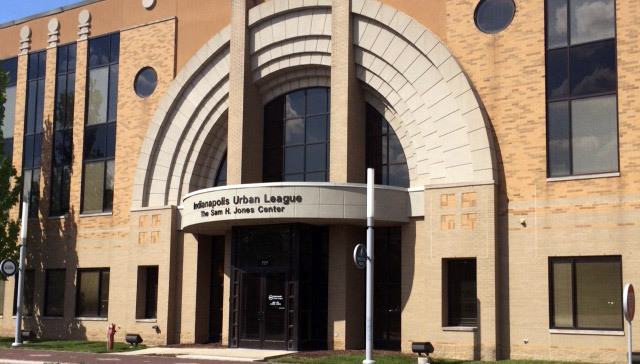 In 2001, the 33,500 square foot, Sam H. Jones Center opened as the new home of the Indianapolis Urban League giving the agency a sense of permanency and ownership on historic, Indiana Avenue. The three-story building was designed by Architect and civic leader, Ifeanyi Vop Osili of Empire Development and Powers and Sons served as the construction managers. Its architecture blends well with nearby historical structures like the Madame Walker Theatre and it features a prominent two-story arched entryway and lobby with high ceilings. In addition to offices and meeting space for the Indianapolis Urban League staff, the facility houses a community multi-purpose room, a board meeting room, two (2) classrooms, and a computer lab. Additionally, office lease space is available for businesses and organizations seeking a downtown location with free parking near many of our city’s top destinations. Current tenants include the IUPUI Kelley School of Business and the Minority Police Officers Association. Click here for facility rental information.